This column is here to review the latest art exhibitions. But, occasionally, something sends a bowling ball crashing through those ambitions. This week is one of those weeks. You will have heard of the opioid epidemic that is devastating America. Who hasn’t? But you may not have heard of its growing impact on Britain, and of the shadow it is casting on our art galleries. You may also be unaware of the long history these galleries have with questionable sponsorship. These are matters in which I am firmly old-school. For me, art should always strive to be on the side of the angels. When it isn’t, it needs calling out. So let’s get back to the opioid epidemic. When you die from an opioid overdose, your breathing goes. First it slows, then it stops. Opioids affect the automatic physical processes, the stuff you don’t think about: your swallowing mechanisms, your lungs, your bowels. Everything fails. So you splutter, you gurgle, you gulp, vomit and die. They don’t tell you this when you visit the Sackler Serpentine Gallery in Kensington Gardens. They don’t tell you when you go around the Sackler Galleries at the Royal Academy or the Sackler Courtyard at the V&A. They don’t tell you when you look up at the Turners in the huge Sackler Room at the National Gallery, or when you investigate art at the Sackler Research Forum at the Courtauld Institute. The fact is, wherever you turn in the British art world, you see the name Sackler. They have sunk millions into some of Britain’s most prestigious art locations. But you don’t see anything about how they got their money. And you don’t see anything about the role they have played in the opioid epidemic. At least, you never used to. But the American artist Nan Goldin has begun to change that. In a series of noisy public protests, Goldin and the pressure group she founded, Pain (Prescription Addiction Intervention Now), have set about highlighting the links between the Sacklers and the drug epidemic that has killed an estimated 400,000 Americans since 1999. In 2014, to relieve the pain from a small operation on her left wrist, Goldin was prescribed OxyContin, the “wonder drug” developed in the 1990s by the Sackler-owned pharmaceutical giant Purdue Pharma. Her doctor prescribed three pills a day. But, “overnight”, she was addicted. Eventually, her consumption billowed to 18 pills a day. When she could no longer afford OxyContin, she started snorting fentanyl, another synthetic opioid that she scored on the street. Fentanyl was the drug, remember, that killed Prince. And it nearly killed Goldin. Her addiction lasted for several years. She survived an overdose, and for a while now she has been clean. 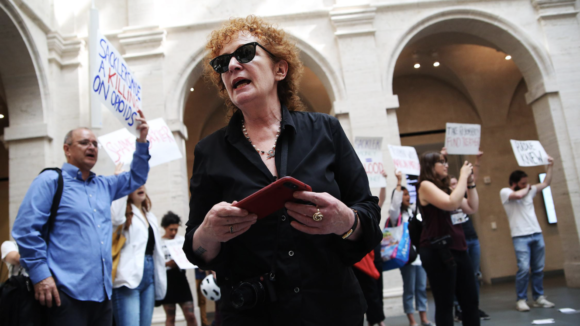 So her considerable anger and energies have been devoted to howling at the Sacklers and demanding that the scores of museums in America that have taken Sackler money remove the family’s name from their walls. Instead, Goldin says, Sackler resources should be directed away from galleries and museums, and towards rehab clinics and drug-awareness centres. Last month, at the Guggenheim in New York, Goldin and her group staged another spectacular “die-in” — the first was last year at Harvard Art Museums — highlighting the links between the Sacklers and opioids. Then, at the Metropolitan Museum, they threw hundreds of pill bottles into the moat that surrounds the Egyptian Temple of Dendur, erected with Sackler millions in 1978. “Shame on Sackler,” they shouted as they threw their pills into the water. In London, news recently emerged that Goldin is refusing to lend her work to a retrospective at the National Portrait Gallery unless the gallery turns down a proposed donation of £1m from the Sacklers. The gallery has yet to decide whether to accept or not. My hope is that it sides with Goldin. These are, obviously, contentious matters. Never in its history has art sided only with the good guys. The Medici were hardly Buddhists. Neither were the Borgias. But two factors today change this ancient dynamic. The first is the sheer scale of the problem. In America, it is estimated that 2m people are currently addicted to opioids. In 2017, more than 130 people a day died from opioid-related overdoses. And, as this paper has been pointing out for the past couple of weeks, all that is heading our way. In those terrible circumstances, is it really right for those who made their billions from this much misery to be lauded relentlessly on our gallery walls? True, the Sackler family members who founded Purdue Pharma are no longer alive, and their descendants have denied any wrongdoing. But art galleries don’t need posh new spaces as much as victims of the opioid epidemic need help. The second thing that gets me is the fact that Britain’s leading art galleries have such an inglorious history when it comes to choosing sponsors. I remember, back in the 1980s, when the Greenham Common protests were still in full swing, how the United Technologies Corporation, which made cruise missiles and Sikorsky war helicopters, sponsored the George Stubbs exhibition at the Tate. Stubbs! Sponsored by the makers of cruise missiles! The Tate has a particularly inglorious record in the field. When I was at Channel 4, the Turner prize had to be dropped for a year when its then sponsors, Drexel Burnham Lambert, were involved in the biggest insider trading scandal in American corporate history. Then there were all the protests about tobacco companies sponsoring exhibitions. And the antics of BP at the Tate, an argument that has now moved over to the British Museum. The fact is, in these days of instant social media condemnation, it will no longer be as easy for our art galleries to turn a blind eye to where their money is coming from. If they have to cut down on their ever-growing expansion plans and build fewer Sackler Rooms, so be it. It’s a small price to pay for stepping over, finally, to the side of the angels.